Do you suffer from TMJ Dysfunction? This condition arises when constant strain, stress, and malocclusion of the jaw leads to pain and loss of function of the jaw joints. This can make chewing (mastication) very difficult and be a contributor to persistent headaches. A malocclusion can be caused from a previous trauma to the face or head, a bite dysfunction, or bruxism (grinding or clenching teeth). Bruxism occurs most frequently during periods of stress and can occur during the day, or at night while sleeping. Injuries elsewhere in the body can also lead to TMJ problems. For example, a childhood fall can cause imbalances within the spine, which could lead to neck and jaw problems later on in life. Other factors involve excessive movement of the ligaments surrounding the jaw joints, or problems involving the disc within the joint that can create audible noises, such as “clicking” or “popping”. Symptoms of TMJ Dysfunction include: head, neck, ear, mouth and/or shoulder pain; clicking or locking in the jaw with a loss of mobility (ROM); pain and tenderness of the masticatory (chewing) muscles. The most common symptom is headaches. 2000lbs per square inch of pressure is exerted at the second molar when the teeth are clenched. It is no surprise that the cranial bones would also be affected if this happened all night long. Massage Therapy is highly effective in relieving TMJ dysfunction. By reducing the tension within the masticatory muscles and creating balance within the cranial bones. This is achieved by extra and/or intra oral massage. 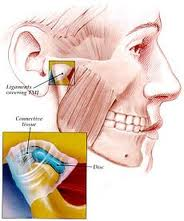 Book a Massage Therapy treatment specifically for TMJ Dysfunction with Sarah Nottingham RMT.